Hello, it's day three of Lawn Fawn Inspiration Week. Today we are featuring two new mini sets, Happy Feast and Trick or Treat. 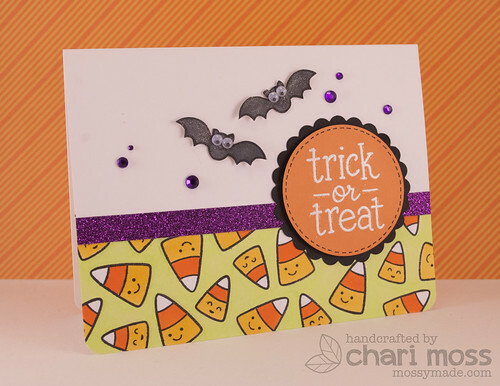 I love the new Trick or Treat mini set, the large sentiment and coordinating images are perfect for quick Halloween projects. I created the "pattern paper" look with the candy corn images along the bottom and colored them with copic markers. I white heat embossed the sentiment on orange cardstock and cut it out with one of the circle stackables. 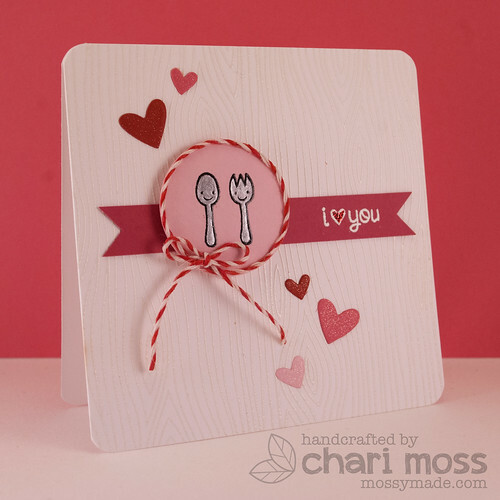 I also used the coordinating scallop circle stackable die to cut black cardstock to layer behind. The bats I colored and cut out and covered in Wink of Stella glitter for some shine. I adhered them down with only a glue dot in the center so that the wings could be bent up to look like they are flying. My favorite part is the google eyes on the bats. The purple glitter stripe is American Crafts glitter tape and I found some matching purple gems in my stash to finish it off. Happy Feast is a great half size set for the Thanksgiving holiday, but it can be used all year long. I used it to create a card that would be great for Valentine's Day or any day of the year. I white heat embossed the new Woodgrain Backdrops on white cardstock for the background creating a cool texture. I stamped the cute little spoon and fork in Versafine black ink and embossed with clear embossing powder. I used Brushed Pewter Distress paint to color my images. I just put some paint on my craft sheet and used a paint brush to pick it up and color in the images. I used peppermint Lawn Trimmings twine to frame my image and cut the hearts out of various colors of cardstock with the Lawn Cuts hearts dies. I added some shine to my heard embellishments with the Wink of Stella pen. Be sure to check out the Lawn Fawn Blog today for more projects with these two sets and some videos by Kelly. She is having a giveaway too so be sure to comment over there! Love the way you put cards together. Both of theses rock.